As I mentioned previously, some plays offer very little concrete information regarding given circumstances. Beckett and Pinter, for example, tend to be elusive. Most plays dole out a small amount of exposition during the first scene or two and may add a bit more history as required later on. But typically the necessary information is what happens in the course of the drama. The world of Ghost Sonata, by contrast, is a web of relationships and conflicts already quite old by the time the curtain rises. The “crimes and secrets and debts” the Mummy movingly alludes to are not committed, kept, or incurred in the play, but rather exist in the past. The meeting between the Student and the Old Man on page three (I will be using the Paul Walsh translation from Undermain’s upcoming production) yields an immediate history. The Student was born during bankruptcy proceedings. The Old Man is accused of having ruined the Student’s father. Or perhaps it was all the father’s fault, and the Old Man was wronged (this ambiguity will be addressed later). An old crime links the characters, establishing a recurring motif of the play. “The sins of the father” will be another motif; in this case it is doubled between the Student’s biological father and his soon-to-be surrogate father, the Old Man. For sheer expository tonnage, Ghost Sonata’s first scene is hard to beat. Strindberg contrives to have the Old Man observe the rest of the cast, identifying each character for the eager Student while recruiting him to his mission. In function this bears a faint family resemblance to the standard scene in a heist movie where one character lays out the plan and each obstacle along the way. In this case, however, it is not simply a matter of marking a laser-triggered alarm system or the slim window of a shift change. The Old Man gives us a history worthy of soap opera, and the nature of the transgressions, in keeping with that earlier introduction, suggests the direction of the play’s action. Here we have a play’s worth of material shoved into one sentence, capturing the old wounds that animate two important characters (three, you could say, once we discover the Old Man’s relationship to the Colonel and Mummy) and suggesting the sadomasochistic thread running through Strindberg’s vision. Next the Student asks about the Lady In Black and instead receives an enigmatic answer about the Dead Man laid out above. This story in turn is interrupted by the Student’s retelling of a building collapse the night before and his effort to save a child. Again, this dramatic action occurred before the start of the play, and though it serves a plot function (the Student’s heroism earns him entry to the Colonel’s house) and a thematic purpose (the falling house and the disappearing child foreshadow Scene Three as a metonym of Strindberg’s cosmic view), the audience will never witness the deed. After a brief aside establishing the Old Man’s fear of milkmaids, he describes his former fiancée, perched in a window. In Scene Two, we will learn that the Old Man cancelled the engagement after his fiancée slept with the Colonel. For the record, it is not important that a spectator follow all of that. None of these characters will feature prominently – in fact, only one of them even appears after the first scene. What’s significant is the involuted, faintly incestuous trail of sin. It’s the genetic signature of the play, expressed in every relationship between characters, and through that information it is possible to begin building a model of the higher-order workings of the play – of world, action, theme. Before Scene One is over, the spyglass will be turned on the Old Man. His servant, Johansson, reveals a rap sheet of murder, destruction, and womanizing. Under the enchantment of the Young Lady, the Student decides to follow the Old Man’s advice anyway and enter the house. When the Old Man finally re-enters and shares the stage with the Mummy, what could they discuss but the past? Counterfeit identities, falsified birthdates, and ancient adulteries tumble out – crimes sixty years old. The Colonel seduced the Old Man’s fiancée. The Old Man slept with the Colonel’s wife (not yet a Mummy) in revenge. Not a single one of them is who he or she claims to be. Here again a higher understanding takes shape out of the fundamental details: Ghost Sonata is a world of old crimes and debts and illusions. 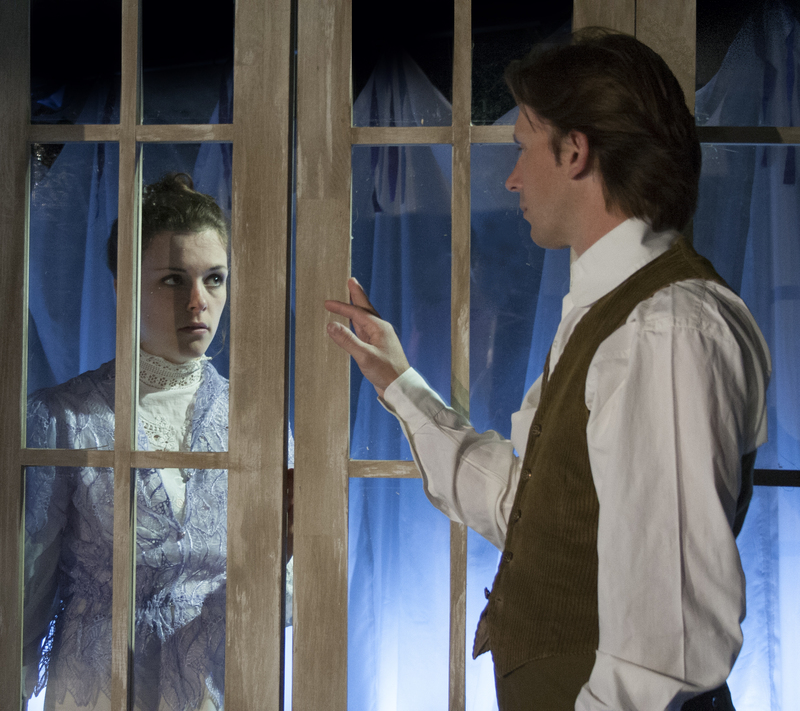 Scene Two ends with the revelation of yet another past sin and reinforces an argument already implicit in the graveyard of given circumstances Strindberg has both built and peopled. The crimes of this world cannot be escaped. Strindberg supplies two responses to that apparent truth, one in Scene Two and another in the highly mystical Scene Three, but those rest beyond the scope of this discussion and the reach of given circumstances. It is a safe bet that nearly half of Ghost Sonata’s running time is spent discussing and reacting to events that transpired before the play begins. The cast is large and complexly interrelated. With plot and characters both so tangled in history, it is a play that demands this kind of background study by those who wish to understand its workings. Happily, Strindberg is an excellent playwright, and plot and character are bound tightly to his themes (almost like a fractal: isolate any point or section of the play and you will find the same pattern). That makes Ghost Sonata especially responsive to this line of inquiry.